Here we have some encouraging feedback from a small selection of learners and schools we are engaged with. We hope you enjoy reading about their experience with us. 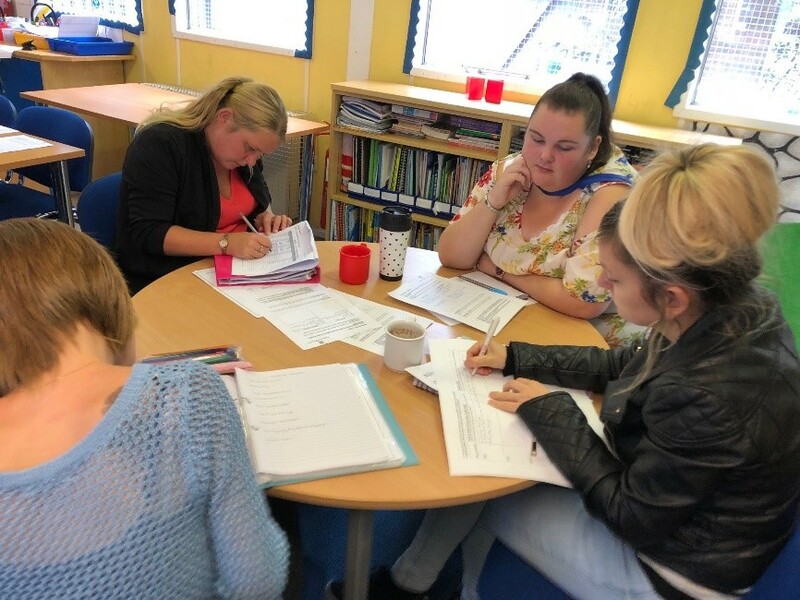 Our learners at Colebourne Primary School working hard on their Understanding Children & Young People’s Mental Health qualification. This course has been very informative and eye opening. It has made me appreciate the stress and pressure modern day children are under. The things I have learnt on this course will help me on a personal and professional level. One key thing I have learned is that children’s behaviour is driven by underlying reasons and it is important to understand and appreciate the root cause. Martin our Tutor was fantastic at his role and made coming to the course a pleasure. I am very pleased that I was able to do the Children & Young People’s Mental Health course. The course itself is very beneficial as you are gaining new knowledge about children & young people’s mental health. This course has helped me a lot and I am starting to have a better idea and understanding, the thought of having homework to do was quite frightening for me as it has been so long since leaving full time education. We receive lots of encouragement and information for useful websites from our tutor Martin. I managed to do my homework and enjoy it at the same time, I felt doing homework gave me a better understanding of the course as you are doing more research yourself. I have gained confidence by writing, studying and sharing ideas with my peers in group discussions. This course has helped me learn that there are a lot of different aspects of mental health that I did not understand, I have learnt that the behaviours and actions of people can be interpreted in many different ways. I am enjoying this course and I am learning a lot from it. I look forward to doing more courses and learning even more about different things. My tutor Martin is doing a fantastic job, he is very helpful and encourages us all to help each other and learn to the best of our abilities. I am glad I took part in this course as it has helped me have a better understanding of people with mental health issues. I am enjoying the mental health course that I am studying. 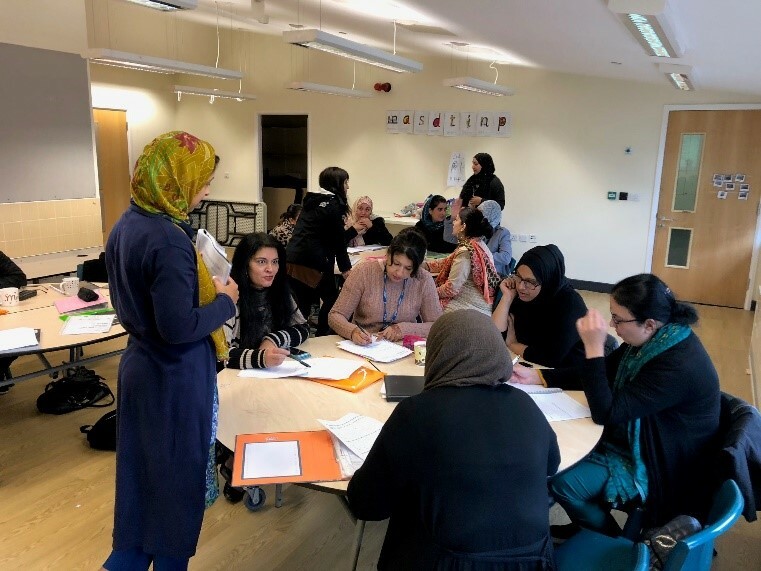 This course has helped me with learning new knowledge about mental health as an illness and how to recognise signs and symptoms someone may demonstrate when often battling poor metal health, especially in young children and adults. I feel proud to know and understand the units in which I have learnt so far. I am very pleased that I have Martin as my tutor, who helps me step by step. I have enjoyed my time on this course so far, because I am now able to apply what I have learnt in class with my children at home and as a lunch time supervisor at my school. Our learners at Heathland Primary Academy attending their Supporting teaching and learning qualification. The learners are working together to identify the different types of schools in the education sector. I have enjoyed studying and being a part of this course. I have gained a lot of knowledge about being a TA and also gained a lot of experience doing my placement. The topic I have enjoyed learning about the most has been safeguarding in schools. I have learnt a lot and it has helped me with my placement. I have also learnt about the school policies and procedures. I have enjoyed doing my level 2 support in teaching and learning. I have learnt so much at a steady pace and understood what was expected of me. My confidence has improved, I have got a lot out of working with the children in class. Being part of the classroom team has made me feel valued and feel I am able to help and guide children. My tutor Sophie has been amazing, I found her level of knowledge and information very informative. Our assessor Lynne is also amazing, supportive and understanding. A group task showing learners from Warren Farm Primary looking at risk factors that can impact on Mental Health, the learners have worked very hard across this qualification. I just want to thank Eagles Consultancy, I have completed a few different courses this year with Eagles. Some of the courses I have done are Level 1 Diploma in Caring for Children and Level 2 Certificate in Understanding Children & Young People’s Mental Health. I am 41 and a mother of 4, I have suffered from mental health for many years as well as looking after my child that also suffers with mental health. I lacked confidence before I started this course however since doing the courses with Eagles Consultancy my confidence has soared. I have finally secured myself a job doing what I have always wanted to do in support work, my course tutor has really supported me and has given me the confidence I needed to go and follow my heart. I had the best time doing my courses and made new friends, I realised my own knowledge and worth and that I can do anything I set out to do. Thank you. Our learners at Brookvale Primary School. I have really enjoyed the course so far, especially the last few weeks progressing onto the Level 1 Diploma Caring for Children. The group I feel work well together and our tutor has supported us well when needed. It’s good to have group discussions and be able to express opinions. I’m continuing to develop and have learnt so much already it’s been good developing relationships and I’m excited to continue after half term. After a few weeks, I was able to settle in after being out of work for a year it was quite daunting to have to come into a class setting. I feel more confident and I even took part in presenting today. When I started this course, I would not have done that. I’m enjoying the course and learning a lot. I feel I’ve gained knowledge in all aspects of the course, I learn more and more every session. I feel our tutor explains the work with detail and in a great manner. The course itself is very interesting and I look forward to gaining more and more knowledge. The group and myself have gained more confidence and I personally feel it has brought me out of my shell a lot more. We have bonded as a group and I’m very happy to attend. The caring for children course I completed has helped with developing my confidence skills. I have enjoyed the experience so far, making new friends with all the people in the group laughing and interacting as a group. It’s also interesting to learn about the development of children and how complex the growth of the child is, even though I have been a parent for a long time. Danny our tutor is also very good and patient with us. Now that my four children are all in full-time education I have a lot of free time, I found out that Eagles Consultancy were starting a Teaching Assistant course and I decided to give it a go. I have really enjoyed this course. I have learnt about different educational establishments. I have learnt about early years social, intellectual and emotional development. I have enjoyed researching about different schools and how they fit into the education sector. Most of all, it’s been a pleasure to be taught by Sophie. She is clear and concise in her explanations; her methods of teaching are very helpful. She is understanding of each individual need in class. I look forward to the upcoming year and everything I hope to achieve. I am enjoying the course so far. I have learnt loads of different topics such as policies and procedures and the meaning of different types of schools. I am finding this course helpful, Sophie my tutor is very good and makes us feel comfortable. I find homework good as it keeps the mind active while not in class. I have started the TA course because I have always been interested in working with children. The opportunity arose when the school where my children attended, started a course. The course is very interesting. The teacher Sophie Bridges is really nice, she helps us understand the work, and helps us one on one as well. I have learnt how to deal with children in different circumstances and the different policies and procedures schools have. I started the level 2 TA course with Sophie, so far I have absolutely loved every lesson. She is a brilliant teacher with a lot of patience. So far, I have learnt about child development and school policies and procedures and I have enjoyed in very much. I am finding the course steady and enjoying the pace that I am learning at, everything so far is brilliant, and I leave my class feeling happy and proud of myself. Sophie is a great teacher! Thank you Sophie! I have currently started the level 2 TA course and I am finding it very interesting. Having been out of work for over ten years I am very grateful for this opportunity. The course is running in my local school which my children are at which makes it very easy and practical for me. I look forward to my lessons. It is a lot less stressful than attending college. I have learnt a lot about working with children and how a school environment works. So far it has been a real eye opener! I am currently enrolled on a level 2 teaching assistant course, when I started I was worried it was going to be too hard for me, but I am really enjoying it and the course has taught me how to work with children. I have seen the school environment and how it works, this has encouraged me to help in schools. I am planning to do additional volunteering in the school when my course finishes. I’m currently doing a teaching assistant level 2 course at Wyndcliffe School. It has been a great experience and has promoted my confidence to a brighter future. I feel I want to go onto a level 3 or possibly apply for a job this coming year. I have learnt a lot about safety and child behaviour. I have gained experience in dealing with challenging behaviour and techniques to handle these situations. I hope to do more courses with Eagles in the future. 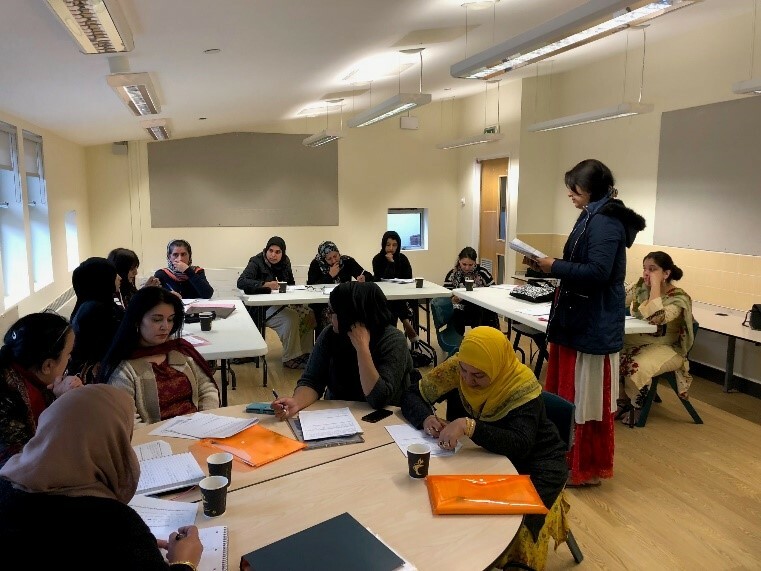 I feel the classes are managed well and they cater to the individual’s needs, I am enjoying my lessons with Eagles Consultancy Ltd.
I’ve really enjoyed the personal & social development course, it was very useful I have learnt new things during this course. My tutor was very kind and helped us, we were given advice of what we can do in the future, I want to say thank you. Khalede joined the Functional Skills Entry Level 2 English and Math’s groups at the school when they were advertised at the beginning of the year. She wanted to improve her English skills and refresh her math’s knowledge. Khalede is always enthusiastic and encouraging towards the other learners, she has made many friends within the group since she started the course. She has recently completed the Entry Level 2 Math’s and English with high scores and has continued to the Entry Level 3 English to further develop her skills in speaking and writing. Khalede participates in sessions and shares her ideas with the group to support her own, as well as others, development. She is keen to learn and asks for extra support or handouts to take home, so she can practice her skills further outside of the sessions. I found the level 2 teaching assistant course useful I’ve learnt a lot from it, from safeguarding to planning a display for the classroom. It has given me the opportunity to work in a school doing my placement as a teaching assistant to give me the experience to see how a class runs on a day to day basis and what kind of role a teaching assistant is. I’ve enjoyed training with Eagles Consultancy Ltd and would highly recommend them to people in the future to do courses. Thank you for the opportunity and support you have given me throughout the course. 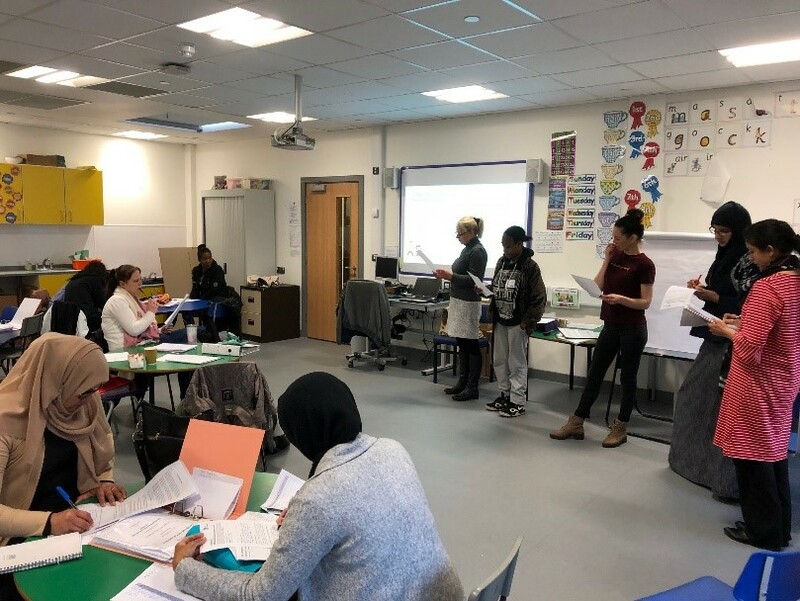 I have really enjoyed doing the level 2 teaching assistant course with Eagles Consultancy, my tutor and assessor were very good at delivering the course to us and were very helpful and supportive. This course gave us the opportunity to cover all topics needed and also have a few hours a week in a placement gaining skills first hand in the classroom. Before deciding to do the Level 2 Teaching Assistant course, I never had any intention of becoming a teacher. However, in this course I’ve gained extensive knowledge and skills and I have achieved great experience as I took on a role as a teacher assistant. The experience I acquired is also useful for my personal life as a mother with school aged children. Also, I liked the tutor’s style of teaching and he was always very supportive. His explanations were always exceptionally clear and easy to understand. This made the course fun and interesting, I have come to realise that being a teacher is something I would really enjoy doing. I have completed the Entry Level 3 Award in Caring for Children, Level 1 Diploma in Caring for Children and Level 1 Certificate in Personal and Social Development. I have just enrolled onto the Entry Level 2 Maths course. The courses have benefited me in many ways such as my confidence and being able to work as part of a team. The teacher is great and understanding. It’s been a great pleasure having this opportunity to do these courses. I have completed the Level 1 Diploma in Caring for Children, and I have now started Entry Level 2 Maths. I have really enjoyed doing this course so far, it has improved my confidence level and has also given me a chance to work with others. Our tutor Danny has been very helpful and patient with us, we enjoy having him as our tutor. I look forward to completing this course. I am currently attending a course with Eagles Consultancy Ltd ; Functional Skills Mathematics Entry Level 2. I have just completed the Entry Level 3 Award in Caring for Children, Level 1 Diploma in Caring for Children as well as Level 1 Certificate in Personal & Social Development. The courses were beneficial in terms of receiving information useful for my home & professional life. Before starting the course, I had many questions about the tutor and if I would be able to attend the course. However, since the first session my tutor Danny Higginson, has put me at ease and all my nerves and worries vanished because of his clear and concise explanations and toleration with the group, he is an excellent teacher; I wish him the best for the future, thank you! As a result of his helpful feedback and guidance, my learning had improved in just a few sessions, if you are interested in taking part in these courses, don’t hesitate to contact Eagles Consultancy Ltd as soon as you can. I am currently doing a level 2 teaching assistant course with Eagles Consultancy. I am happy with my progress in the course, it hasn’t been so hard, but it was challenging for me at times. Sophie, my tutor is always there for me if I need her help. I am always in class on time and have never took a day off, I have never been behind on my work. I have now handed in my completed folder which I’m proud of. I have worked very hard when doing my work. I am doing my placement at St James Primary School every week and I am happy there. The teacher and TA in the class are very supportive, I’m always listening to anything they say and watch how they teach. They value anything that I say and have helped when I had things to do within my course and observations. Every morning when I go into my placement, I feel so proud looking at the display I did with the children on the wall. This course has opened new doors for me, my goal is to work with special needs children. My experience with Sophie Bridges as a tutor at Eagles Consultancy Ltd has been really good because her method of teaching is excellent, Sophie makes it easy for me to understand the subject which she is teaching. She talks about the subjects in detail. I found it easy to learn from Sophie so that is why I decided to do the teaching assistant course. She is very easy to talk to whatever your problem is and is very positive, polite and professional. She never judges you I feel, and I would love to do the Level 3 in supporting and teaching. I would definitely jump at the chance. I have learned that I am a good communicator, I am kind, polite and I listen carefully to other person’s concerns. My time keeping has been good and I have enjoyed this course. I have also been okay with any homework set by Sophie. On this course I’ve learned that you never know the answers to everything and that I’ve learned some new meanings that I never knew. The course has been a fun course and we have all the support if we need it. My experience on the course has been enjoyable and I’ve learnt a lot that I never knew before. I have found the course helpful and interesting (safe guarding, health & safety). Danny has been very helpful and patient and I’ve enjoyed coming to the course. I have enjoyed my time on the course and I’m going to miss attending the lessons. I have really enjoyed my time in the class and have always felt welcome and part of the group. Danny has been a great tutor and has always been ready with support me when I’ve needed it and ready to answer any questions I have. Lynne has also been a great support for me when attending placement and guiding me in the right direction when I’ve been unsure of what is expected of me. I would recommend Eagles Consultancy to anyone who may interested in their courses. I have really enjoyed the course. It was a laid-back environment and we learned at our own pace. I didn’t feel rushed to complete any work that I didn’t understand. Danny has been a great teacher taking his time to go over everything thoroughly so we understood and could complete the work. Lynne has been great coming out with limited time to assess us and signing off our folder. Thank you Eagles Consultancy I now have my level 2 and have more knowledge to hopefully get a job working as a TA. I thoroughly enjoyed all the courses that we have done so far and hope to carry on with other courses that are offered. Our tutor has been very helpful and answered any queries that we have had, I have enjoyed being part of a group of likeminded ladies who all help each other and are eager to learn. I have really enjoyed the courses that have been provided to us, I have found them interesting, educating and I’m really looking forward to completing more courses offered to us. I find my tutor Danny very helpful. Whether it is a question we need answering or help with work, Danny is always on hand to offer his support. I have had a great opportunity to study the teaching assistant course at level 2, which I was looking forward to and was thinking about for the past 3 years. My tutor and my class members gave me a lot of support. I have really enjoyed the course, especially when we work as a team and help each other. If anyone from the group finds something difficult, we try to make it easy for them, also our tutor is always ready to help with any issues we face. Our tutor is keen to explain the whole lesson and make it easy for us to understand. In this course I learnt different topics regarding how to work with the children, how to support the teacher in the classroom as well as how to include everyone in the activities. I enrolled onto this course quite late in the summer, as it was unavailable at my school. After I completed my maths and English exams, I was accepted on the course. I was very nervous to start the course, as I was going to do it in an unfamiliar school, and I did not know anyone. Once I attended the first session, I was very happy with the group as they all welcomed me and were friendly. I thoroughly enjoyed this course as it is very beneficial for the type of job I want to go into. I have enjoyed the placement which is part of the course and every taught session by the tutors. Both the tutors are very supportive and always help us with our work. I have found this course very interesting and has given me a lot of knowledge, I have always completed my homework on time and did further research to broaden my knowledge. I am really pleased that Eagles Consultancy have given us the opportunity to attend this course. I have enjoyed completing my Entry Level 3 Maths and English. The Teaching assistant course has also been enjoyable and challenging. I have learnt a lot about children’s behaviour in the classroom and safeguarding, health and safety, organising a display and working as part of a team. The tutors are very helpful and supportive I look forward to completing the level 2 and either looking for employment or further studying. The Teaching Assistant Level 2 course is very interesting for me. When I started the course, it felt hard and there was a lot of work to do but my tutor made this course as “easy as pie”. I am enjoying my course because my teacher is so pleasant, kind and friendly. I enjoy working with the children at my placement, the most enjoyable part has been making my display with the children. I thought it would be hard, but my teacher explained to me so that it became simple. I have so far enjoyed all of the Teaching Assistant course including the English and Maths elements. The course has been challenging at times, I have attended placements in school and worked on a display with the children. Everyone from Eagles has been very supportive and encouraging and have motivated me throughout the course. I completed the Level 1 Diploma in Caring for Children I enjoyed doing this course learning about the development and safeguarding children. 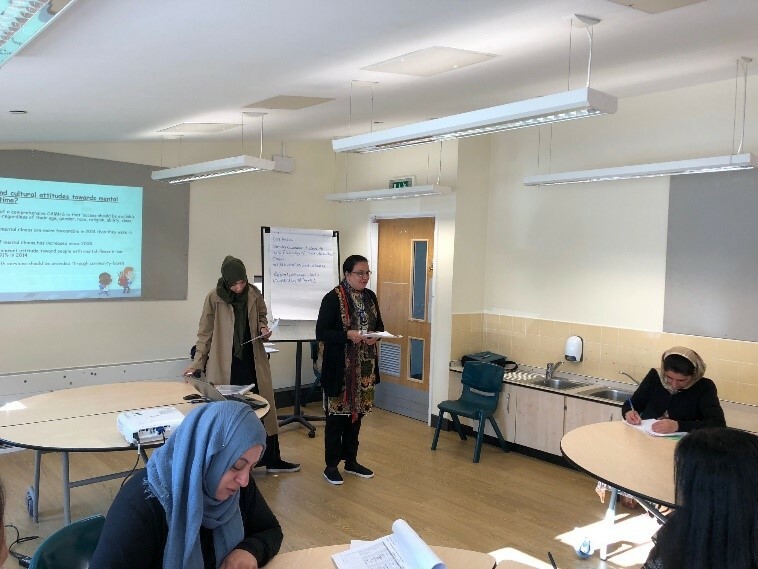 After that I went on to do the Level 1 Certificate in Personal and Social Development course where we learnt about different life skills such as managing money problems and job searching. We have just started the Level 2 Certificate in Understanding Children’s and Young People’s Mental Health I am looking forward to doing this course. Having completed the Level 1 Diploma in Caring for Children, I found the course very interesting especially the safeguarding unit as it helped me understand more for my role as a scout leader. 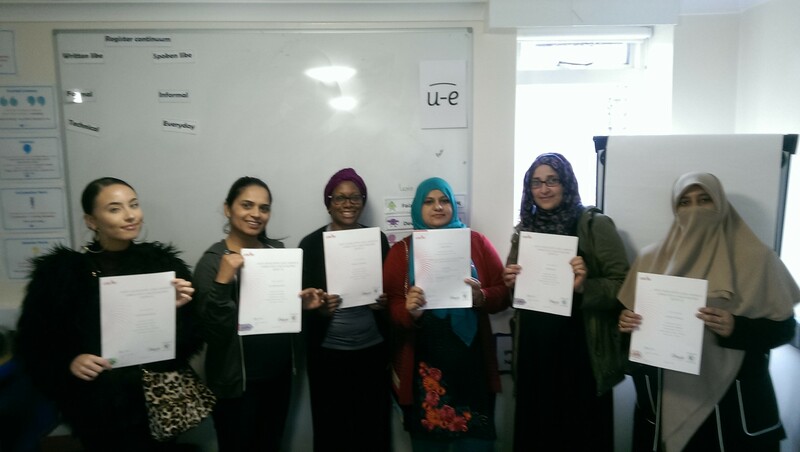 We then went on to complete the Level 1 Certificate in Personal and Social Development which was useful, we covered life skills such as managing money, bills, and debt, we also covered job search and completing a CV. At present we are doing the Level 2 Certificate in Understanding Children’s and Young People’s Mental Health, this course is very enjoyable so far and I’m eager to learn and expand my knowledge. These courses has been brilliant, Danny is a brilliant tutor and I have been so happy to come every week and learn something new. It’s so handy being at my daughters’ school and not having to pay for the course. The other’s in my group who have also completed the courses are all so helpful and nice, we always have a laugh but also get work done, I can’t say thank you enough for giving us this opportunity. I am currently enrolled on the Level 2 Certificate in Understanding Children & Young People’s Mental Health, I have found it very interesting this course has really impressed me. I hope to learn much more, Danny is a fantastic teacher it has been a pleasure to be taught by him. I have just finished my personal and social development course. I really liked working together and having discussions with the group. I am more confident now than before I now know where to go and find a job. Before I used to be really shy and now I can work with other people. I just finished my personal and social development course and I am happy to learn new things. I enjoyed having discussions and working together. I feel I have improved myself. Overall, from the beginning, I have personally developed gaining confidence in every aspect, which I had not realised. Cognition was an eye opener, also attachment theories became one of the most important parts for me to become able and allowing to believe in myself. Confidence level has been a major boost for myself and although the other members of the group were not known to each other, by the time we reached the end of our course we all became very good friends and supported each and everyone in the group. This course has inspired me to gain confidence in being able to learn and enjoy with no pressure or deadlines. Any concerns during the course were always dealt with in a lovely and professional manor and I would like to thank everyone who has helped me along in this course and made me into the person I have become. Thank you again. I like this course because it gives me more knowledge of caring for children. It helps me with my confidence. I improved my confidence a lot. I learnt about child behaviours. The teacher is very friendly and makes us understand easily. I will be very happy to carry on another course. When I first started the childcare course, it was daunting because I hadn’t done any courses since college. However, I soon felt at ease and the teacher named Danny was very helpful and very informative. He was always there to help you if you needed help. The mental health course was even more informative and helpful hence I have three children who suffer from autism. Overall the venue itself was more helpful since my son goes to that school. In general, I am very happy with my experience with Eagles consultancy and I would recommended them to friends and relatives. I enjoyed my level 2 course a lot. It was a lovely experience to work with children and do my qualification at the same time. This year is even more interesting, I am doing lots of activities with children while my tutor is observing me, this gives me the chance to do more with children in different rooms too. My tutor is very supportive, so if I have any kind of problems I can get help anytime. I am really enjoying doing my qualification. I have had a great time working with Eagles Consultancy Ltd for over two years completing my Level 2 Children and Young People’s Workforce and Level 3 Early Years Educator apprenticeship as well as completing my Functional Skills English Level 1 and Level 2. I have had lots of support from my assessor Lynne Garland along with the rest of the company it has been great, I have had extra support in my examinations due to my dyslexia as well as assistance throughout my two courses. I cannot thank the staff enough and advise you stick with Eagles as they are amazing. I have been on my Level 2 Children & Young People’s Workforce apprenticeship for around 4 months, so far I have learnt all about the ERR (employment responsibilities and rights) I have also learnt about the procedures of my setting, I have learnt all about British values along with also doing my functional skills. Whilst doing this I have been doing my mandatory units such as my MU24, TDA2.1,TDA2.14 along with SHC23. Throughout the apprentice Lynne has given me a massive amount of support within my functional skills and I have learnt a lot from her, Lynne knows that I have had a bit of time off from my job role due to being ill she has been very understanding with it. Lynne supports me with any questions I may have. © 2019 Eagles Consultancy . All rights reserved.